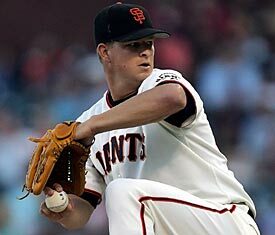 Word is the Giants might part with Cain, who is 5-7 with a 4.06 ERA in 20 starts, if offered an intriguing package of young talent. Miller also reports the Phillies are looking at the Pirates’ left-handed reliever John Grabow, who wouldn’t be worth as much as Rockies’ reliever Brian Fuentes. Grabow is 5-2 with a 3.35 ERA this season, with 37 strikeouts and 21 walks in 45.2 innings. Cain and Grabow is more like it. Cain has much more promise than Joe Blanton (or even AJ Burnett at this moment), and I would think about giving the Giants Carrasco for him, while Grabow would be a steady lefty for the pen.